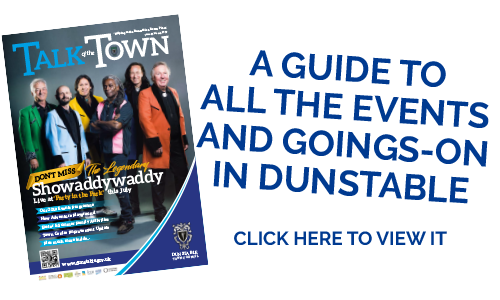 All goods are offered for sale subject to availability Dunstable Town Council regrets that occasionally it may not be possible to complete your order if stock runs out or is withdrawn for any reason. If there is a problem, we will contact you as soon as possible. Prices on our website are quoted in pounds sterling and are inclusive of any VAT that may be payable by the customer. Customers are responsible for any applicable customs duties or taxes in their own country. It is our aim to despatch orders within seven (7) working days of receipt. Occasionally, due to unforeseen circumstances, this may not be possible. If there is a problem, we will contact you. We operate a returns policy. If you are not entirely satisfied with the goods you receive from us, please return them in the original packaging within 28 days of the date of dispatch Priory House, 33 High Street South, Dunstable, Bedfordshire, LU6 3RZ. Once we receive your item, we will inspect it and notify you that we have received your returned item. We will immediately notify you on the status of your refund after inspecting the item. If your return is approved, we will initiate a refund. Please note that when returning an item, the parcel is your responsibility until it reaches us. We recommend that you ask your post office for a proof of posting (available free of charge). This guarantee does not affect your statutory rights. You will be responsible for paying for your own shipping costs for returning your item. Unless the item arrives damaged from shipping, in which case photographic evidence will be need to be provided before a refund can take place. The damaged item need not be returned. Shipping costs are non refundable. If you receive a refund, the cost of return shipping will be deducted from your refund.